"A nun in Cincinnati was excommunicated and dismissed from the Sisters of the Precious Blood after admitting she was secretly ordained as a priest this spring. Sr. Letitia “Tish” Rawles was serving as a “catacomb” priest in order to not cause trouble for her religious order. Rawles knows what she would choose if there was an option on returning to her order. An online petition is currently underway which the ARCWP hope will send a message to Pope Francis to allow Rawles to continue as a Sister of the Precious Blood and overturn her excommunication and others in the Year of Mercy. Rawles told NCR she feels a mixture of things now that this secret is out. Being a priest is not something new for Rawles. She said she’s always wanted to be a priest and always had a calling to help other people. Rawles believes she was able to help a lot of people as a nun, both in the Sisters of the Precious Blood for 25 years and her previous 22 years with the Sisters of the Incarnate Word. But she also felt she needed to go into something deeper, which turned out to be priesthood. Some of her ministry includes helping the sick and dying, giving last rites, funeral services, prayer services and presiding at home liturgies. Rawles doesn’t know what her next step may be, but she does know the religious community is putting together a financial package because of her major medical issues." Last rites, funeral services, prayer services and presiding at home liturgies. Rawles doesn’t know what her next step may be, but she does know the religious community is putting together a financial package because of her major medical issues. A nun in Cincinnati was excommunicated and dismissed from the Sisters of the Precious Blood after admitting she was secretly ordained as a priest this spring. Ensure Sister Tish Rawles can continue as a Sister of the Precious Blood by overturning her excommunication and all excommunications. As we enter the Year of Mercy, the People of God ask you to show Christ's mercy to Sister Tish and all who have been excommunicated . Sister Letitia "Tish" Rawles, a faithful, committed Catholic, has served as a Catholic sister for 47 years: 22 with the Sisters of the Incarnate Word, and 25 with the Sisters of the Precious Blood. She has also felt a call to the priesthood since her childhood. 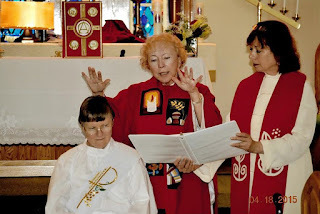 In April of this year, facing serious illness, she followed God's call and her conscience and was ordained a Roman Catholic priest with the Association of Roman Catholic Women Priests. Since Sister Tish's ordination, she has faithfully served the sick and dying, performing prayer services and administering last rites at her nursing home. When the Sisters of the Precious Blood discovered that she was following her call to the priesthood, she was dismissed. Pope Francis has promoted a "Church of Mercy, which he states "excludes no one". He has shown mercy to controversial priests across the political spectrum, allowing formerly dismissed priests to say Mass, and schismatic groups to grant absolution. The Association of Roman Catholic Women Priests and Roman Catholic Womenpriests ask Pope Francis to live the Church of Mercy by overturning all excommunications. This action will allow Sister Tish and all women called to the priesthood to serve their communities in peace. "Letetia Rawles served as a local nun for decades, offering prayers and help for countless others. "Yahweh you are my shepherd I want nothing more. You let me lie down in green pastures… in green meadows you lead me beside restful waters,” read Rawles. "Women can be priest. It's a man-made law. It's a man-made law the Vatican needs to make some changes on,” Rawles said. "As a catacomb priest means that you don't do anything in public you do things privately,” said Rawles. “Pope Frances has declared this coming year as the year of Mercy. So we are requesting from Pope Frances, that all excommunication lifted,” Rawles said. With progressive multiple sclerosis, type 1 diabetes and end stage liver disease, she hopes that prayers she's prayed for others won't be in vain." 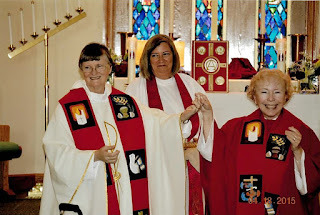 Cast Out: Nun Excommunicated for Becoming a Priest"
"After nearly five decades as a Catholic nun, Tish Rawles became a priest—and found herself cast out. Now she’s calling on Pope Francis to do what Jesus would’ve done and bring her back. When Letitia “Tish” Rawles was ordained as a Catholic priest in April, it was the culmination of a lifetime’s worth of yearning—and a practical fix to ministering to the sick and dying at her Cincinnati assisted living facility, where it was often hard to find a priest to administer last rites. “I’ve wanted to be a priest since... probably the fourth grade, as soon as I started attending Catholic school,” she told The Daily Beast. 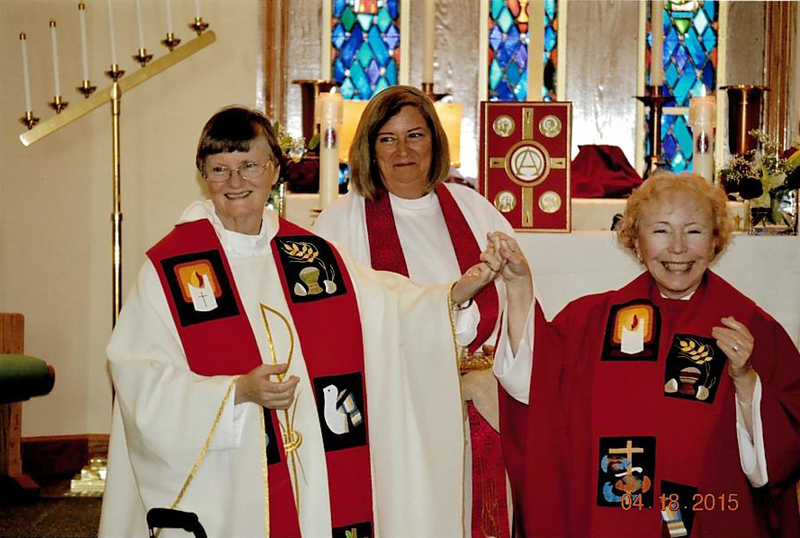 “I always wondered why there were no women at the altar, only men.”But Rawles didn’t know any female priests then, so she became a nun despite feeling the “deeper calling” of the priesthood. “And I’ve loved being a nun,” she said. 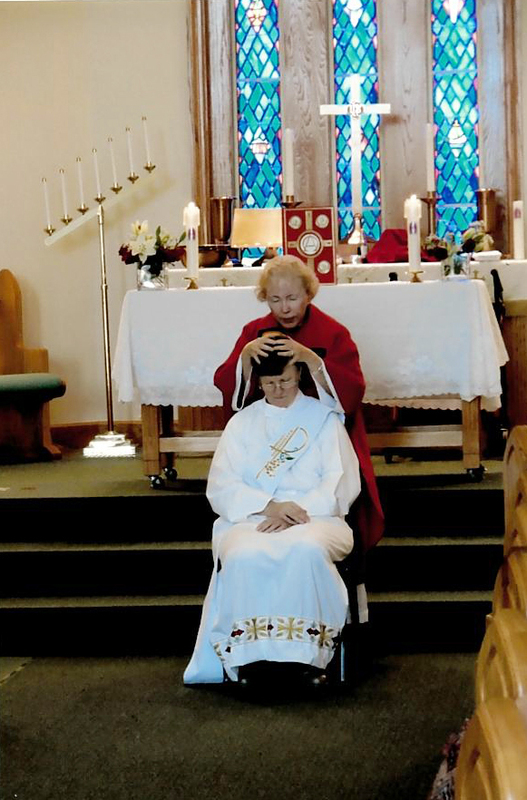 The 67-year-old had that taken away from her last week, though, when the Ohio-based Sisters of the Precious Blood, the order she’d been with for 47 years, found out about her ordination and told her she was out. She was automatically excommunicated from the Catholic Church, which bars women from the priesthood and shows no signs of budging from that position.Now Rawles and her supporters say they’re appealing to Pope Francis during his Year of Mercy to restore her to the church and to her order. That’s what Jesus would have done they say. "This is an opportunity for Pope Francis to take a step towards reconciliation and healing misogyny in the church,” Bishop Bridget Mary Meehan of the Association of Roman Catholic Woman Priests told The Daily Beast. “The full equality of women in the church is the voice of God in our time. The ARCWP is one of many organizations pushing for allowing women to be Catholic priests but an outlier in that it ordains women. Meehan said the ARCWP’s female bishops were even ordained by an anonymous male Catholic bishop, linking them to an unbroken lineage leading back to the apostles. Did she know it was against the rules, did we know it was against the rules? Of course,” Meehan said. “But we are the Rosa Parks of the Catholic Church.”The ARCWP emphasizes the Catholic concept of “primacy of conscience,” which it says allows it to choose to dissent from an unjust teaching." News on Synod: Is God Laughing or Crying? Enjoy! During this Holy Year of Mercy the Association of Roman Catholic Women Priests (ARCWP) asks Pope Francis to Reinstate Sr. Letetia Rawles (known as Sister Tish) who is 67 and critically ill as a Sister of the Precious Blood. She is stricken with the debilitating illnesses of multiple sclerosis, end-stage liver disease and Type 1 diabetes. For the past two years she has lived in an assisted living facility in Cincinnati, Ohio. 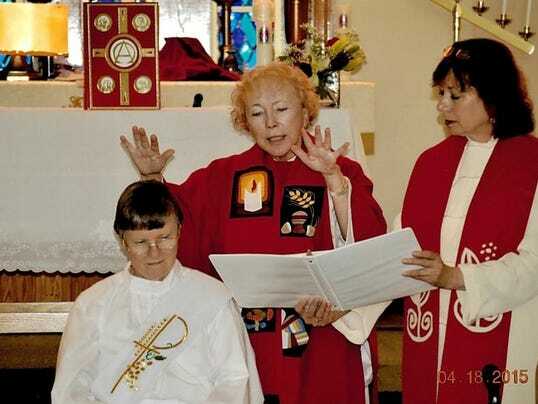 Sister Tish followed her conscience, was ordained a catacomb woman priest on April 18, 2015, and was dismissed from her religious congregation on Oct 22, 2015 after 47 years of selfless service to the people of God. Why such a drastic punishment? She became a woman priest. “I felt called to the priesthood since childhood,” said Sr. Tish. 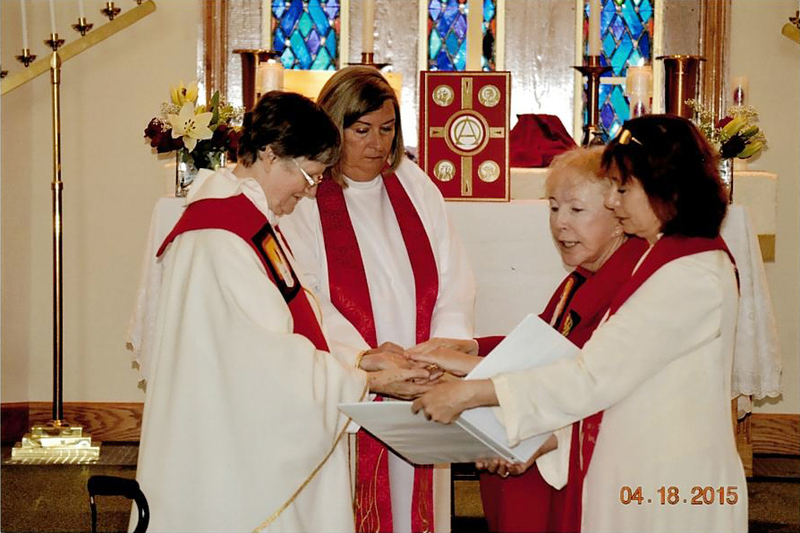 Inspired by encounters with other women priests, she began the journey to priesthood several years ago. “I thought that before I die, I want to fulfill God’s call and my life-long dream to become a priest,” she said. At present, she ministers to the suffering and dying in the assisted living facility where she resides. “It feels like I am walking on holy ground as I anoint the hands of the dying, pray with them, and preside at their funeral Masses.” She also celebrates Eucharist in inclusive liturgies in underground house churches. Her nun’s story began in 1968, at age 21, she entered the Sisters of the Incarnate Word and spent 22 years with them before transferring to the Sisters of the Precious Blood. While with the Incarnate Word Sisters, she taught grade 3 through 8. She also earned her Masters degree in guidance counseling. When she transferred to the Sister of the Precious Blood in 1990, she worked as a clinical supervisor in mental health and as a chemical dependency therapist. She has been member of the Precious Blood Sisters for 25 years. On Sunday, Oct. 25th, 2015 in a speech closing the historic Synod on the Family, Pope Francis declared: “Today is a time of mercy.” Here is an opportunity for Pope Francis to put his words into action. This tragic dismissal of Sister Tish cries out to heaven for justice and compassion. We ask Pope Francis to revoke the dismissal of our beloved Sister Tish, a nun cast out of her order, because of the harsh punishment of Vatican excommunication. The full equality of women in the church is rooted in the Gospel. Certainly this is not how Jesus, who embraced women, would act. Moreover, we call on Pope Francis to lift the excommunications of all women priests, our supporters and all Catholics who follow their consciences. 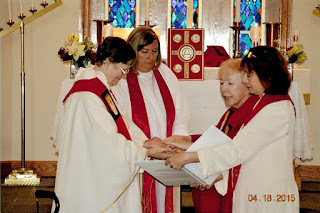 I ordained Sister Letetia Rawles, (known as Sister Tish) a deacon on July 19, 2014 and a priest on April 18, 2015 in Cincinnati in the Association of Roman Catholic Women Priests. Bridget Mary Meehan, a bishop serving Association of Roman Catholic Women Priests. We had a Table of Remembrance that people brought photos and other mementos to be our Opening ritual. Our opening song was, "Bring Him Home" by The Piano Guys. 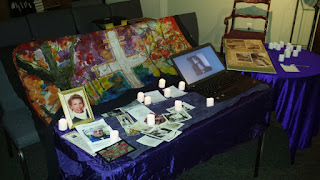 https://youtu.be/5mJ08-pyDLg During this time people came to the Table of Remembrance and lit a candle. It is just having moved to the other side. I am still what I am and you are still what you are. What we used to be for each other is still the same. Call me by the name you used to. And talk to me as you have done before. Do not use a different tone. Do not be rigid or sad. Continue to laugh about what used to make us laugh. Think of me and pray with me. Let my name be mentioned at home as before. Without any exaggeration or distress. Life continues to mean what it always did. The thread did not break. Because I am far from your sight? You will find my heart and my love pure. Wipe your tears and do not cry. As we planetary pilgrims enter the darkest time of the year, it seems right and holy to descend and process the dark and troubling parts of our own souls. The leaves are falling in a beautiful dance. What might we let fall away from our own lives? In conversations I've had recently, I have heard the need that so many of us have for healthy grieving. This is one area in my life that I have had some profound experiences. As I've often mentioned, I suffered my whole life from clinical depression. One of the most healing things that happened during my time in psychotherapy was the realization that I needed to mourn the loss of my mother. The woman who had been a loving mother to me descended into mental illness when I was 9. I was nearly 40 before I realized I needed to grieve that. The tears were so healing and the feeling of liberation made me feel like an eagle soaring. Church should be a safe place to do grief work and we are going to have an opportunity to do that today. I hope we all feel free to cry here as well as laugh. Psalm 30 says God will turn our mourning into dancing. But first the tears... I remember back to a time in church, St. Peter's, that I had tears of mourning. It was shortly after we moved here and I was sad about leaving our previous home. I dashed into the bathroom to cry. If that's where you need to go, that is fine. If you need to go outside that is fine, if you want to go sit in your car that is fine too. I have an exercise that I am offering as part of our celebration today. It comes from my spiritual director's training program. We will take a few moments to do this and then come back together to share if anyone wishes to do that. If this isn't for you just take this time to do as you please. If this is too much for you to do here, you may take it home with you to try later. I am sure any one of us can be a listening ear for your sorrow, if you feel more comfortable doing this one on one. And of course the Holy Spirit will be with you if you prefer to do it one on one with Her in some other place and some other time. To me this is the beauty of this model of church. We take responsibility for our own growth. You participate here to your own comfort level, no judgment, only acceptance and compassion. 1. What memories do you hold dear about the person or persons you are remembering today? 2. What legacy(ies) did he/she/them leave with you? 3.How have you felt God's perceived presence or absence or both as you grieve? 4. What Scripture verses bring comfort to you as you grieve? 5. What lessons have you learned from God as you grieve? 6. What would you offer in the way of suggestion to someone who is newly grieving? All: The table of bread and wine is now to be made ready. All: "This is my body which will be given for you. Do this in remembrance of me". Loving God, you call us to join with you in creating the world anew! All: This is the body of Christ for the Body of Christ. Presider: Christ has no body now but yours. Go be the eyes, ears, arms and feet of Christ Sophia. All: Thanks be to God! Recessional: "When the Saints Go Marching In".